You know how people used to love to say (usually on nerdy Internet forums), "Guess it's time I dusted off my Wii!" every time an interesting game was announced or released for Nintendo's latest console? Well, I say the same thing every time an interesting game hits Microsoft's XBLA or XBLIG services. The fact is, I don't turn on my Xbox 360 all that often. In part that's because the system is in our basement (lame reason, I know, but it's cold and dark down there! ), and in part it's because I just don't have much interest in it or its games these days. My Xbox 360 won't be dusty for much longer, though, thanks to the digital trifecta that is Fez, Sega Vintage Collection: Monster World and Spelunky. Oddly, I've only bought (and barely played--surprise, surprise!) the most recent of these releases--that being Spelunky--thus far. Mark my words, though: Both Sega Vintage Collection: Monster World and Fez will follow suit later this week. Have any of you played one or more of the above-mentioned titles? If so, what did you think of them? Spelunky is pure gold. I can't recommend it more highly. Although, to be honest, I like the graphics of the original better than the updated XBLA graphics. But I'd love to try the XBLA one just to see what has changed. I actually like the graphics of both versions, Justin. In a perfect world, the XBLA release would include the original version, too. I know most folks would ask, "Why bother?" but I always prefer to play games on a TV using a controller, rather than on a computer with a monitor, etc. Anyway, I'll have to try the PC version sometime soon and let you know if there are any differences! 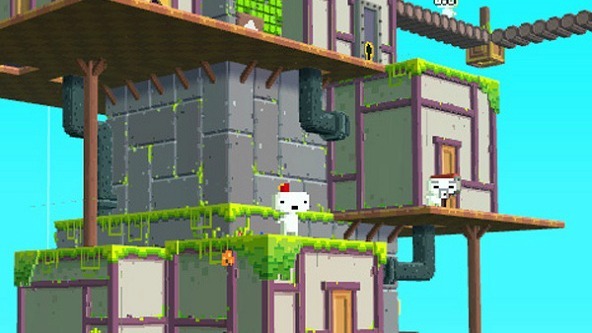 I couldn't get into Fez, it's too obtuse to be fun. I really want to play the Monster World collection and Spelunky though, but I'm broke now. Almost finished w-Monster World 4. The game is brilliant -- fun, gorgeous, good length, etc. Holds up really well after 18 yrs. Also it's got some really frustrating moments where I was really glad I chose to emulate it. Save points are few and far between so emulator save states are extremely helpful. As for Spelunky, I played the freeware version awhile back, and just found it to be too tough to be fun. Not sure if they've eased.up on that for 360. My bad: blog. Notch and C418 created Minecraft. CYM: Huh. You're one of the first people to tell me they didn't like Fez. I still want to try it, though. It'll be interesting to see if I end up liking it or not. As for Spelunky: If you like some of the other 'punishing' platformers on XBLA, you'll probably like it, too. I'm really enjoying it so far, although I'm not that good at it. BTW, you should play the free PC version of Spelunky until you can afford the XBLA version -- unless you've already played it? Haven't bought Monster World Collection yet. Maybe this weekend? Absolutely love the games, though. From what I've read, the XBLA version of Spelunky isn't any easier than the PC original. Regardless, what I've played of it so far definitely couldn't be described as easy. Still, I'm enjoying it. Hey there, Sora! Thanks for pointing out those Twitter accounts. I'll have to check them out! Speaking of Fez and freeware, have any of you guys checked out Sky Island? It's a flash game, and supposedly just like Fez -- but it came out a long time before Fez did. It's fun-ish I suppose, but it's making me thing a whole full-length game of this isn't something I really need. You can try it here. Hmm, never heard of Sky Island before now, warp. I'll give it a try soon, though! Sega not charging for retro content piece by piece. I guess it's good Wonderboy is such a niche series. Except for achievements, I don't really care for the point count but I love playing classic games like Sonic and Pacman and doing the little goals. I remember the ones on the big Sonic Genesis disc were pretty bland. Pretty much "do big goal, next big goal, end game" for every single title. Hey there, Adam! Yes, I guess you could say some of the Monster World games were pretty basic platformers, but not all of them. In fact, I believe two of them included in this collection were quite 'deep' and included a number of RPG-esque elements. Don't quote me on that, though, as I haven't played one of them in ages and I've never played another. The one I have played, though -- the first one -- is quite fun, if archaic, and that's the real reason I want this release, although I'm looking forward to playing part IV for the first time, too. 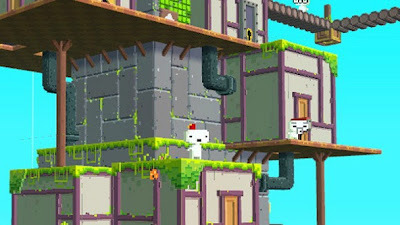 Currently playing Fez and really like it. Little hand-holding and lots to explore. It reminds me most of something like Impossible Mission for the Commodore 64, and that's a good thing. The 3D-2D mechanic is a nice novel puzzle format, more fun than Paper Mario. I haven't played Fez yet. Even though it was one of the games I really looked forward to during 2012. After watching Indie Game: The Movie I can't resist it any more. I MUST PLAY IT! Hey there, SpeLinnea! Sadly, I haven't bought it yet either. Maybe next week? I've heard good things from others about Indie Game: The Movie, BTW. Guess I should get on that soon, too. Anyway, I hope you get to play Fez soon and that you enjoy it!